The middle race of the Ardennes classics returns us properly to the Ardennes region of Belgium. Goodbye to the Dutch speaking Flandrians, and hello to the French speaking Wallonians! Flèche Wallonne is tucked in neatly between the Amstel Gold race and the forthcoming Liège-Bastogne-Liège — at one time, the latter race took place on the same weekend as La Flèche Wallonne, and they were referred to as ‘Le Week-end Adrennais’. Flèche Wallonne started the way (nearly) all great bike races start — to promote a local newspaper! This time it was Les Sports, with the race first run in 1936. This is now the 80th edition of La Flèche Wallonne (or “Arrow of Wallonne”). This week, the race starts in Marche-en-Famenne, 40km northwest of Bastogne, which will have its day in the sun on Sunday. It finishes in Huy, atop the famous Mur de Huy. When the race was first run it was 236km in length, peaking at 300km in 1938. Today it’s a mere 196km, and since 1990 the race distance has not exceeded 210km. After the start in Marche-en-Famenne, beer lovers in the peloton will be tantalised as they pass through the famous beer-producing towns of Rochefort and Ciney within the first 66kms — sadly, no feed zones there, though, but nice for the roadside fans! This first section of racing is mainly just a leg-stretcher before the final 130km, which comprises three circuits and a total of six different climbs — five ascents on the first lap, five again on the second, and then two more on the final short lap for a total of twelve tough climbs. The first two climbs, Côte de Bellaire (1 km, 6.3%) and Côte de Bohissau (2.4 km, 5.5%) are short, and not too sharp, so won’t trouble the riders too greatly. 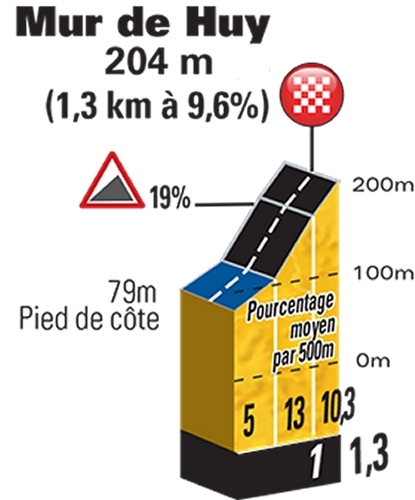 Then we have the Côte de Solières, which is the longest climb in the race, which is 4.3km at 4%, but again, there are no sharp sections, so a strong and steady tempo will be the order of the day. This will all go out the window when the riders take on the Mur de Huy at 100kms for the first of three times. It’s only 1.3km long, but it averages 9.6% (topping out at a leg popping 19%!). The first few hundred metres aren’t too torturous, but it then shoots up to 11%, then 17%, and then 19%, before finally dipping back down towards 6% in the final 100 metres. 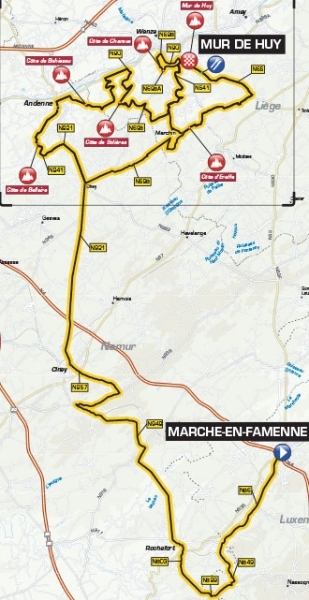 Next it’s on to the Côte d’Ereffe, which is 2.1km averaging 5.1%; however, the riders won’t take this as any respite, as the first 1.5km average around 10%, with the gradient lost in the final 600m, which are almost completely flat. The riders will race that loop twice, and then, after the second ascent of the Côte d’Ereffe, the riders are on the final stretch with just 16kms remaining. We will most likely be seeing a pretty large peloton at this stage. However, given the cagey manner in which Amstel Gold was raced — leading to a great opportunistic win — this might mean that we see the big names keen not to miss out a second time, forcing their teams to set a peloton-shattering pace into the final circuit. The final ‘mini circuit’ will take them over the Côte de Serave, which is short, but packs a punch at 8.1% average. They crest this with 5.5kms remaining, and then it’s a final drag race up the Mur to the finish line. As you’d expect, Belgian riders have dominated the race in the past, with 38 of the 79 victories going their way. However, the race has had a distinctive Spanish flair in recent years, with three Spaniards taking four wins here since 2012 (Moreno ’12, Rodríquez ’13, and Valverde ’14 & ’15). Only seven riders have achieved the “Ardennes double” by winning both Flèche Wallonne and Liège-Bastogne-Liège in the same year: Ferdi Kübler twice (in 1951 and 1952), Stan Ockers (1955), Eddy Merckx (1972), Moreno Argentin (1991) Davide Rebellin (2004), Alejandro Valverde twice (in 2006 and 2015) and Philippe Gilbert (2011). The latter two riders will be taking to the start line on Wednesday. Let’s take a look at the riders in with a shot of winning this year’s race. Alejandro Valverde is game for a hatrick and record-breaking fourth victory. He is in his typical, perpetually-high form, recently taking the G.C. at Vuelta a Andalucía as well as the recent Vuelta a Castilla y Leon. He is the overall favourite going into both of the Ardennes races, and he’ll be supported by past winner Daniel Moreno, Carlos Betancur (who is also back to winning ways, taking the opening stage at Castilla y Leon) and also the ever-strong Giovanni Visconti. The next few days will also be a good gauge of Valverde’s form before his appearance at the Giro. We’re really not sure who will be the leader for Etixx-Quickstep this week, as both Julian Alaphilippe (6th at Amstel Gold and 8th at De Brabantse Pijl) and Petr Vakoč (Winner of De Brabantse Pijl) are on superb form. Alaphilippe also had a stella maiden Ardennes week in 2015, coming 2nd behind Valverde in both Flèche Wallonne and Liège-Bastogne-Liège, so on paper he will be aiming to move one step up on the podium. They both now have Daniel Martin as a teammate, who won LBL in 2013 and was unlucky not to do so again in 2014. He’s had a mixed opening to the season, with a recent abandon in Vuelta al País Vasco, but he’s also shown good form recently, beating the big Grand Tour G.C. hopefuls on a summit finish in the Volta a Cataluyna. Depending on how Martin is feeling when he turns up will likely determine who leads the team. And let’s not forget the powerful supporting cast for Etixx, Bob Jungels and Gianluca Brambilla. Philippe Gilbert didn’t have the best of Amstel Golds, losing the pace and being spat out the back in the final kilometres. He doesn’t really look to be in the same shape as he was in 2011/12, and looked to be suffering the effects of having to cycle with two of his fingers pinned and strapped together (ouch). Samual Sanchez offered an attempt at a late attack at Amstel Gold, in messy circumstances. But we feel BMC’s real chance of a result is the young Belgium Loïc Vliegen, who finished 9th at Amstel Gold and 10th at De Brabantse Pijl. He could sneak under the radar on Wednesday and get his way on to the podium, if he keeps his cool on the Mur. Tim Wellens had a fantastic Amstel Gold, and has to be considered. He didn’t have a big enough gap when he hit the Cauberg, but the peloton can’t afford to let him try again — he came so close to a big solo victory. In a group, he can’t really compete with the others on the Mur, so we’d expect him to try a similar tactic in the last 10km. Tony Gallopin was 3rd at De Brabantse Pijl, and then, like most of the big favourties, missed the big move in Amstel Gold. His best finish at Flèche Wallonne was 16th in 2013, but he finished 5th when the Tour De France ended on the Mur de Huy last year — so he can handle ‘The Wall’ alright. Plus, he’ll want to take a win before he focuses on his Tour De France preparations as a confidence booster, and this finish suits him well. Joaquim Rodríguez is another big name Grand Tour rider who’ll go well on the Mur. He has had a pretty quiet early season though; a non-finisher at Amstel Gold after a crash, and his best result so far this year was a fourth place (Stage 5 at País Vasco). He did, however, win the Tour de France stage last year that finished on the Mur de Huy, so if he’s got anything like that form then he should be capable of a solid top 5. Sergio Henao is expected to be Sky’s leader for Flèche Wallonne, and the finish should suit his climber’s abilities. The team had a shocker at Amstel Gold with defending champion Kwiatkowski getting dropped and then getting off his bike. All eyes were on Henao as a back up. Ultimately, Sky had burnt too many matches to keep him in a strong position, but he went well considering he’d been expecting to lead Michal into the final ascent, and he finished in 28th. He’ll have Lars Petter Nordhaug and Peter Kennaugh for company, as well as Wout Poels, who could himself do some damage on that last climb. Michael Albasini absolutely buried himself for the team at Amstel Gold, with numerous turns at the front of the group in an attempt to reel back the breakaway. He looks to be the team’s leaders for Flèche Wallonne, and should go well, despite perhaps lacking the punch to kick up the Mur. Michael Matthews is on the squad, but, despite Matthews supposedly retraining from sprinter to stage racer, we can’t see him competing amongst the best on the Mur. A rider who could, though, is Adam Yates, and it will be interesting to see how the young Brit gets on in his first participation of the race. If Albasini should falter, then Yates will be just behind to take on the race for Orica. Diego Ulissi finished an impressive 7th at Amstel Gold, after what has been a quiet few weeks for him since his decent peformances at Tirreno-Adriatico and The Tour Down Under. His best performance here was 9th in 2012, and he looks like he could equal or better that this time around — mark him down for a strong top ten. Rui Costa, on the other hand, will have been disappointed with his 17th placing at Amstel Gold, after a strong Vuelta Ciclista al País Vasco and Paris-Nice. He has never finished higher than 18th (2012) here, and he’ll likely be looking towards the lengthier parcours of Liège-Bastogne-Liège. Ulissi, therefore, for team leader. Cannondale come here with dual leaders in Tom-Jelte Slagter and Simon Clarke. The Dutchman has had a pretty mediocre couple of months, with a 9th at De Brabantse Pijl the only thing to write home about (he was 60th at Amstel Gold!). The rider who should be the main option for the team is the reborn Australian Si Clarke, who has had a great start to 2016 with his new team. Stage top 10s at Tirreno-Adriatico and País Vasco show that he’s on some good form at the moment, although again he raced a poor Amstel Gold (47th), but a big win doesn’t seem far away. Micheal Woods should be down as an outsider after he burst on to scene at the Tour Down Under, although since then he hasn’t finished higher than 21st. Warren Barguil is definitely and defiantly back this month, with a couple of top tens at Vuelta Ciclista al País Vasco and 15th at Amstel Gold, and it’s great to see that he’s recovered from the horrifying training accident in January. He’ll have Simon Geschke as support, as well as the promising young Dutchman Sam Oomen, who took a couple of top tens at the Critérium International and finished 3rd overall — he’s one to watch for this race in the future, perhaps. Roman Kreuziger rode a pretty decent Amstel Gold, with a powerful attack that neatly set up his teammate Micheal Valgren for a surprise 2nd place. Both should be in the mix again here, and a top 10 looks entirely doable for Kreuziger. However, we doubt the same tactic will work again here, and Tinkoff can’t count on the same late lull in the bunch that led to Valgren’s podium place. Kreuziger will have to attack, and attack hard. We are now in official outsider territory when we get to Dimension Data. Igor Antón and Serge Pauwels are their best bets for what would be a surprise win. The Spaniard is the most likely candidate, and Antón has previously finished in the top ten three out of the four times he’s entered this race. We’d also put good money on Steve Cummings to attack nice and early on the final ascent of the Mur. Who knows — it might stick! Other outsiders of note include Roompot’s Pieter Weening, Wanty’s Enrico Gasparatto (we don’t think it’s doing him a disservice to say there was a lot of luck involved in his Amstel win), Cofidis’s Julien Simon, LottoNL’s Wilco Kelderman, Ag2r’s Jan Bakelants, and Astana’s Diego Rosa. Andy is playing the favourites game and opting for Alejandro Valverde. He’s got the form, he’s got the motivation, now can he make it to the finish for a record-breaking fourth win? You can at least safely bet on Valverde being up for it. Chris is rolling the dice this time, and rooting for Joaquim Rodríguez. His form has been patchy this year, as we noted above. But if you take into account a decent País Vasco, the only reason we didn’t see him fly up the Cauberg was because he crashed into the kerb. Here’s hoping he can arrive at the Mur in one piece. James likes Dan Martin. We can’t get past his performance on Stage 3 in Cataluyna, although Martin has lacked in consistency. However, if he turns up on form and avoids any misfortune, then few will be able to beat him on the Mur. He’s also James’s pick for the ‘Ardennes Double’ (…the odds at the bookies of him doing that are currently around 70/1).